The museum is located in the former Shevlin School, a two-story brick structure built in 1911. The school closed in 1991 and the historical society “History Center” opened in 1996. 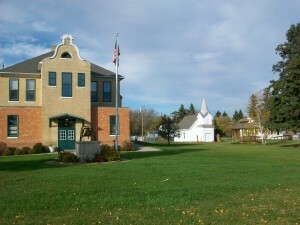 The grounds also include several historic buildings: the first log school built in the county in the late 1880s, a school built in 1936 by the local WPA crew, the Ebro Depot (a small transportable depot- the size of a box car), and The Halvorson cabin (a two story log cabin from 1904). Two additional buildings on site house larger tools, machinery and miscellany. Exhibits are changed on a 12 to 18 month schedule, with different themes and topics covered each year. The museum also has a photo collection of over 11,000 prints, some cemetery records, an extensive obituary file and most newspapers from the county (on microfilm) dating back to 1899. Research assistance is free and donations are cheerfully accepted. Highway 2 in Shevlin (7 miles east of Bagley). All year: Tuesday through Friday 10 a.m. to 4 p.m. and during the summer on Saturdays from 10 a.m. to 2 p.m. Also last Sunday of the month from 1:00 – 4:00 Additional hours are available by appointment. Current Exhibit: The Home Place: Homesteading in Clearwater County 1896. Exhibit closes August 1, 2017. Exhibit runs August 22- November 4.